The best practice of Self-Directing Professionals has been ‘captured’ and is ready to share with your organisation. This programme is the result of research into why some people quickly become competent and successful in their work whilst retaining a very good life outside of work. The programme research started in a major UK organisation and the results proved exciting. When spread across many different organisations the research findings were the same and demonstrated that what differentiated the successful, effective people from the less effective was one key attitude and set of 7 skills. The effective people studied had naturally acquired a particular mindset and a set of skills and their success was nothing to do with having a high IQ. It was more to do with EQ – Emotional Intelligence, taking charge of their own learning and life, being Self Directing. The best practice of Self-Directing Professionals has been ‘captured’ and is ready to share with your organisation. We help you understand yourself and develop the mindset of these successful people, developing and honing your skills along the way. By committing to this particular mindset and demonstrating the seven skills covered in the programme consistently and systematically, you, too, will become highly effective. The programme explores the key attitudes of Responsible Initiative and the 7 key success skills. These skills can be studied and learnt by anyone. 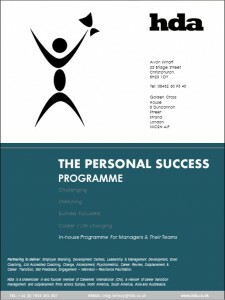 The Personal Success Programme is designed to develop these critical skill-sets in your managers and employees. It is the programme which sits alongside our Leading & Developing High Performance programme – hand in glove – with several key principles over-lapping. This means that as all parts of the company develop together rather than managers being ‘done unto’ by leaders.